In 2018 a rather quite interesting story cropped up in the news regarding a dispute on the Interstate Borders in the High Himalayas between Himachal Pradesh and Jammu and Kashmir. As per the Himachal Authorities the JK Police had set up a picket more than 18 kms than the designated Border between the two States. And this led to an altercation. Of course the matter was brought to the notice of the Central Government. There were other charges as well against the Jammu and Kashmir Government including that it had given land in Himachal across the Shinku La and around Sarchu. The story started in 2014 when the JK Police set up a new border check Post supposedly in Himachal territory. The Himachal Government despatched CID Officials to ascertain the facts and they came back with the report that there was indeed an intrusion. The DC of Lahaul and Spiti wrote to the authorities in Padam and Leh as the JK part comes within the Kargil District and the Tehsil is Zanskar. But nothing much happened. In the following years again the JK Police set up its check Post in what was said to be Himachali territory. Again the issue was raised and this time the Central Government intervened. A team of Experts was sent from the Geological Survey of India to demarcate the Border and they concluded after doing a scientific Satellite study that the JK Police was Post was 14 kms inside Himachal. The DCs of Leh, Kargil and Lahaul and Spiti were also present but the DC of Leh refused to go with the findings of the team and said that he will have to consult “higher authorities”. And the matter remains unresolved to this day. Lets see where the JK Police puts up its Post on this disputed inter state boundary which sits at over 14000 ft. So how was the present day Boundary agreed upon and demarcated earlier. Well it was after Maharaja Gulab Singh had taken over as Rule of the whole of Jammu, Kashmir, Ladakh and Baltistan that a boundary demarcation was needed between the British territory of Lahaul and the Maharaja’s territory of Ladakh. The boundary was flexible in earlier times as the general area was the place where the boundaries of the Kulu and Chamba Kingdoms also met. And also of Lahul, Spiti and Ladakh. And there was constant struggle between Ladakh, Kulu, Chamba and Bushahr over Lahul and Spiti. So a settlement of the Border was needed. And it was none other than Captain Alexander Cunningham who was assigned this job. People who have read on Himalayan explorations are well familiar with the Cunninghams. All the 4 Cunningham brothers wrote extensively on the History of India and were Military Officers as well. And Alexander was perfect for adventures in the Mountains. Infact it is Alexander Cunninghams account of the Battle of Toyo, where General Zorawar Singh fell in Battle with the Tibetan Chinese Army thats considered the most authentic. And this is how the Boundary was finally marked. Leaving you with the actual Note on this by Alexander Cunningham published in 1848. Answers many questions and also gives an idea of how boundaries were demarcated in the Himalayas dependent on the Peaks, the Passes and of course the Rivers and the Nallahs and in some case a solitary big Rock. And leaving you with the final boundary Map as well. Memorandum by Capt. 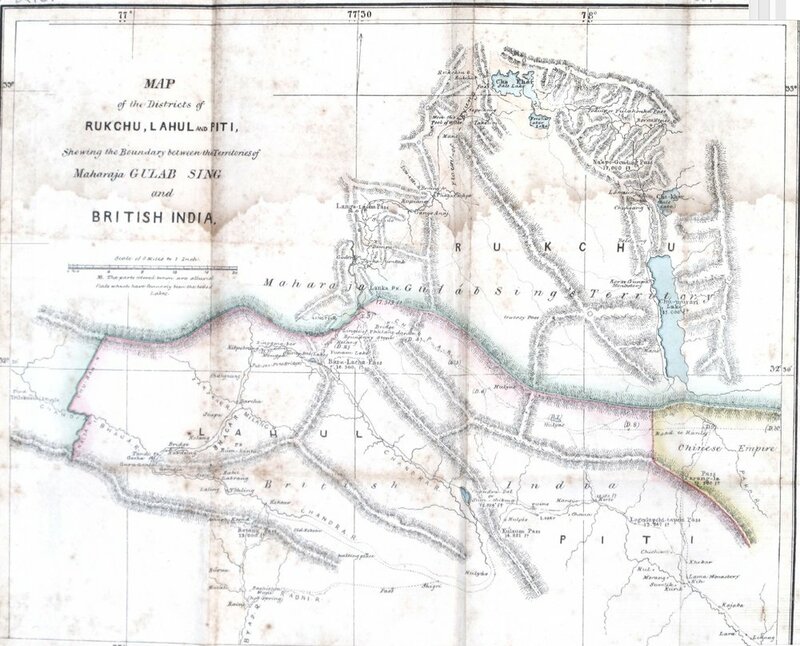 A. CUNNINGHAM, detailing the boundary between the territories of Maharaja Gulab Singh and British India, as determined by the Commissioners, P. A. VANS AGNEW, Esq. and Capt. A. CUNNINGHAM of, Engineers. 1.In laying down a permanent boundary through a mountainous county it appeared to the Commissioners desirable to select such a plan as would completely preclude any possibility of future dispute. This the Commissioners believe that they have found in their adoption as a boundary of such mountain ranges as form water-shed lines between the drainages of different rivers, as detailed below. 2. In 1839, when Capt. A.Cunningham surveyed the Lahul district the boundary between the states of Kulu and Chamba was formed by the Nalda and Chukam Nullahs, two tributaries of the Chandrabhaga, the one on its left and the other on its right bank. From the head of the Chukam Nullah the Commissioners determined that all the county to the eastward which is drained by the Bhaga, the Chandrabhaga and their tributaries belonged to the British district of Lahul ; and that the boundary between Lahul and the Zanskar district was the snowy range (called Paralassa by Dr. Gerard) dividing the drainage of the Bhaga and Chandrabhaga from that of the Zanskar river, as marked in the Map. 3. Beyond the Bar Lacha Pass to the eastward, the Commissioners found that there was an old well known boundary stone, called the Phalangdanda, which marked the limit between Lahul and Ladak. This stone is noticed by Moorcroft . It stands in the midst of an open plain on the right bank of the Yunnam River. As there sno known or recognized boundary mark on the other side of the stream, the Commissioners selected a remarkable cream-coloured peak, called Turam, as the northern limit of the British territory on the left bank of the river. As this peak is situated at the end of one of the spun of the great snowy chain, already determined as the northern limit of the Lahul district, it forms a natural continuation of the boundary line from the westward. The bearing of the Turam peak from the Phalangdanda is 9" to the northward of west. 4. As it appeared that the country to the eastward of the Pha-langdanda belonged to Piti, the Commissioners determined that the boundary between Piti and Ladak on the westward should be the Yunam River. A straight line was accordingly drawn from the Pha-lang-danda to the junction of the first Nullah on the right bank of the Yunam, from which point the Yunam River forms the boundary as far as the junction of the Cherpa or Cherep river. 5. Almost due north-east from this junction there is a remarkable square rock on the top of the hill, which From its resemblance to a fort has received the name of Lanka. This curions and well know peak wan selected as another fixed point in the boundary, to which a straight line should be drawn from the junction of the Cherpa river. Beyond this to the eastward, the Commissioners, adhering to the principle which they had first laid down, determined that - the whole of the Cherpa valley and its tributaries belonged to the British Government; and that the snowy range on its right bank which feeds d l the northern affluents of the Cherpa river should be the boundary between Ladak and the British district of Piti. This same range extends towards the east past the southern end of the Chu-Mureri Lake, where it forms the well known boundary between Ladak and the Chinese territory. The Commissioners therefore determined that the boundary between Ladak and Piti should continue from the head of the Cherpa along this same range to the Chinese boundary; thus including within Piti all the streams which water that district, and giving to Ladak all the streams which water its southern district of Rutchu.